A top floor self catering apartment with 2 bedrooms, Kitchen/Diner, bathroom, it has its own private entrance to the rear of the property. The larger bedroom has a double bed plus a single. The second bedroom can be set as 2 singles or used as a double; this room also has the addition of a separate shower and washbasin. The kitchen/diner is fully fitted with an Oven, 4 ring hob and Microwave oven/grill, all the normal kitchen appliances are available. The bathroom has a corner tub with an overhead shower, washbasin and separate toilet. Sat TV and Austrian DTV in the Kitchen/Diner along with a DVD player, Sat TV can be set for ‘free to air’ European TV coverage or UK. There is a small fenced off garden area at the rear with a table & chairs which can be used for a BBQ or eating outside. 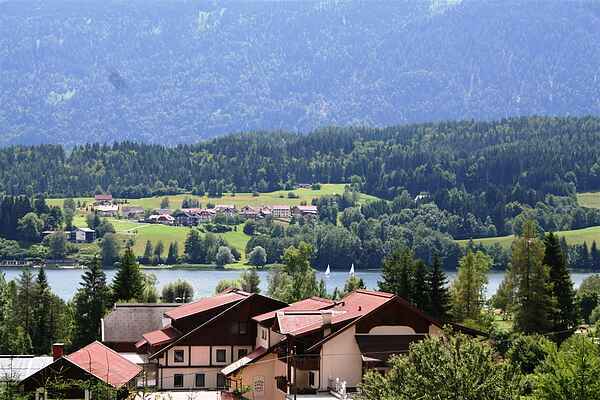 There is a selection of restaurants in Presseggersee within walking distance in winter and additional lakeside cafes/restaurants in summer, more restaurants can be found at Untervellach, Obervellach and Hermagor a short drive away. The lake is a 2 minute walk from the apartment to the Strandbad (Beach) and childrens' amusement park, lake water temperature in mid summer can be 28.C. Presseggersee has easy access to all the walking and bike trails in the area, for travel further away the ÖBB train station is a short walk, local trains connect to Villach and thence Klagenfurt or Salzburg or continue to the head of the Gailtal valley at Kotschach-Mauthen and the Plöckenpaß into Italy. The Nassfeld Millennium Express gondola opens in summer from June to September for easy access to the higher mountains and a selection of adventure sports are available. In winter Nassfeld offers over 100 Kms of well groomed pistes spread over 3 valleys, with levels to suit most skiers, from Black* to Blues up to 3 km long, there are 2 areas for learners at the Treßdorfer Alm and another at Sonnenalpe. With good snow conditions in the valley there is a cross country ski trail a few minutes from the apartment, Ice skating is also available on the lake normally between late December to early February, it is a short 2 minute walk to a free ski bus for Nassfeld. A multi day ski pass at Nassfeld allows access to all the main ski resorts in the Carinthia region. Cot is available in addition to the 5 beds on request.